Form Forge developed the RDE-1 to be the most advanced large-format 3D printing toolhead on the market. We use this tool for our own research and production projects and use the theory of the RDE-1 for many custom additive tool design and consultation projects. 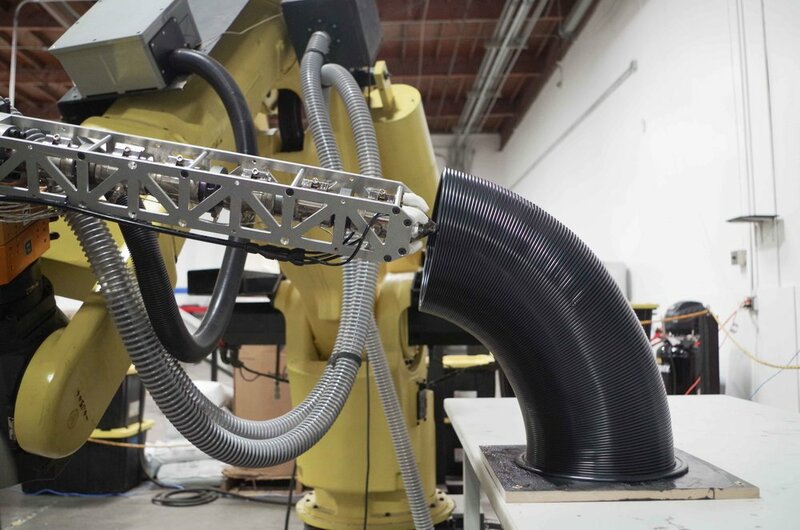 Related areas of research include additive manufacturing with custom composite materials, fringe applications of an additive process as well as multi tool automation. With large-scale robotic motion platforms becoming more common outside automotive manufacturing, we have made our expertise available in providing installation services on six-axis robotic arm work cells; integrating single and multi tool processes in new and exciting ways. If you are creating a workcell for additive manufacturing or hybrid manufacturing, our tools and technical services may also be available for temporary or long-term use. All installations are dealt with on a case-by-case basis. A combined twenty years of additive manufacturing experience provides our team with significant insight into the possibilities and practicalities of additive manufacturing as a production method. From carbon fiber molds to architectural cladding to boutique furniture, Form Forge has designed and manufactured 3D prints for multiple industries. We love to push the bounds of what is possible with our system as well as yours. Take a look at some of these past projects in our portfolio and see if our expertise might be beneficial to a project of yours.